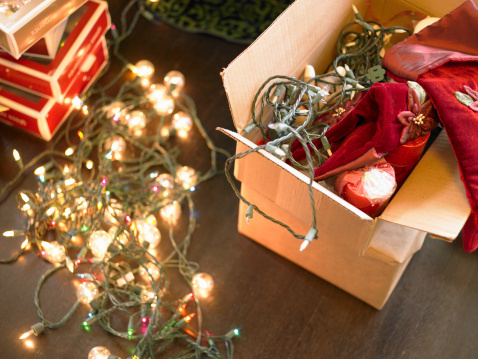 "Go ahead and check all the decorations that you're using year after year," said Electrical Safety Foundation International President Brett Brenner. "So, no breaks in the wires, no broken bulbs -- those types of things." "We see a huge spike in fires between Christmas Day and New Year's, so it's very important that until you get rid of that tree that it remains watered and cared for," the Electrical Safety Foundation International said. WASHINGTON — When setting up Christmas trees and decorations, a little care and attention can help prevent them from becoming fire hazards. Position your Christmas tree out of harm’s way, away from open flames and someplace it can’t be tipped over by a child or pet. Keep decorations at least three feet away from heat sources. Do not run extension cords under carpet, rugs, furniture or windows. Only use decorations and extension cords outdoors if they’re designed to be outside. Turn off decorations when you leave home or are sleeping. Use battery operated, flameless candles. Keep live Christmas trees watered consistently. “We see a huge spike in fires between Christmas Day and New Year’s, so it’s very important that until you get rid of that tree that it remains watered and cared for,” Brenner said. Just in case something tragic does happen, Brenner recommends you make sure smoke and carbon monoxide alarms are working.